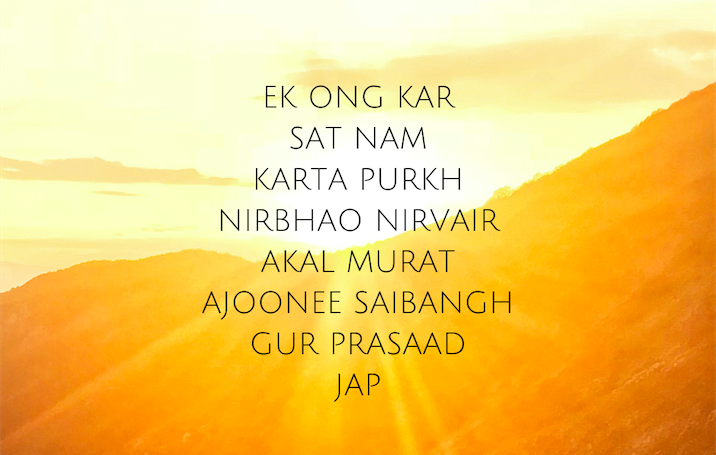 The Mul Mantra is one of the seven mantras Kundalini Yogis chant as part of the Aquarian Sadhana, the early morning practice as taught by Yogi Bhajan. This mantra was given to the world by Guru Nanak, an enlightened master who lived over 500 years ago. In a few words he captured the working of the Divine. Yogi Bhajan said everything you need to know is inside these few words. What does it say? This mantra shows you there is only One, existing within everything that exists, which means also inside of you. This may be one of the hardest things for us as human beings to accept. We are spirit in form. And everything and everyone around you is this one and the same spirit. Yogi Bhajan says this very straight: If you can’t see God in all, you can’t see God at all. ‘All’ so also including you. Truly embracing yourself as a divine being, one with the source, is all about self-acceptance, self love. You are not just a part of God, God is nowhere outside of you, you are God. The source, spirit, is the doer of all, the emanating power in all that exists, all that you can perceive. So ultimately it is also the power behind each and everything you do, the power that makes you breathe, the power that made you develop in your mother’s womb. It’s all a divine play. This source of all that exists is self-existing, meaning it was never born, of itself it has no shape but it expresses itself in unlimited forms and shapes. It will never die, it doesn’t know anger, hatred or fear. This doesn’t mean that we as the divine incarnated do not know these emotions, we do! And that is okay. But the invitation is to not let ourselves be ruled by these emotions and to recalibrate, to tune ourselves again and again to truth of what we are, Sat Nam. Chanting Sat Nam can already be a powerful tool to help you move out of the grip of destructive emotions, because you remind yourself of your source, spirit. Guru Nanak gives one very clear pointer in this mantra, this is the word: Jap! To recite, to meditate. Use the sacred words to refine your mind, to help your wandering mind to turn its outward focus back within. This is where you can experience yourself in a way that you cannot describe in words. That timeless sense of being, that which has never come and will never go. That which you can experience through your physical body, when you are willing to make the journey within, when you do your jappa (meditation or reciting a mantra). Feeling this source within yourself can give you so much peace and joy, and helps you tap into a timeless source of energy, it’s like you become a co-creator with the Universe to help bring this peace into the world and to serve others. When you can acknowledge that you are not here by the will of your ego, but that there is much greater sacred energy behind your existence, you can open yourself up for the touch of Grace, and get to experience that there is no heaven after death, heaven is right here and now! This truth is always true, a truth cannot be true one day and be something else the next. The essence of truth is that is doesn’t change. Your body changes, your life changes, everything changes, but that what you truly are does not! Mul Mantra are the opening words of Japji a century old poem called ‘Japji’ written by Guru Nanak, in total Japji consists of 40 steps (pauris), pearls of wisdom that point you towards the truth of of who you are. Each and every pauri is a step towards your True Self and all 40 of them have their own specific healing and transformational power. Kundalini Yoga School is happy to offer you an online sadhana to deepen your understanding of the 40 Pauris of Japji with the 40 Day Online Sadhana ‘Going Beyond’. For 40 days you will learn and recite one verse (Pauri) per day and you will receive extra guidance to go to the depth of its meaning and relevance for you in your life right now. You will deepen your experience through the daily practice of the ‘Kriya for Transcendence’, which you will practice with a gorgeous video on the website of the online Kundalini Yoga School (see the trailer below). It’s a deep spiritual inner journey that you can start anytime. This 40 day Sadhana is a transcendental inner journey with a daily practice of an ancient sequence of meditative exercises (30 minutes) in combination with the exploration of Japji, making it a deep spiritual experience. Besides the Practice Video of the Kriya and the daily guidance email you will receive a video each day to help you recite the Pauris and really get to the essence of their meaning. This course is beautiful opportunity to establish a personal relationship with one of the cornerstones of the Kundalini Yoga practice.